- 1 large container, a water reservoir (on the surface) or a tank (buried). A complete range is available, from the simplest system to the most elaborate. It can be used for drinking (rarely, except after additional treatment), for domestic use, for vegetable gardens, for school toilettes, etc. This is a simple, robust and rather inexpensive system, that has been used for centuries, as in the atrium in Roman homes, and which was above used for irrigation and domestic uses. This technique which is often forgotten in most regions is now expanding just about everywhere, and not just in the country. 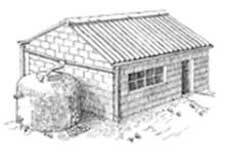 As such, it is now easy to find information seminars on the use of rainwater. Likewise, several cities or governments subsidise the equipment costs for collecting rainwater for their inhabitants. In France in Bordeaux (€60 per reservoir) or Drancy (€100), etc. As for the French Tax Code, since August 2007, for private individuals installing a rainwater recovery and treatment system, a tax credit equal to 25% of the cost of the equipment (with a ceiling of €8000), with the total cost of an installation being about €2 to 3000. Water is getting harder and harder to find or expensive. Yet this system is rather effective and inexpensive for collecting and storing water, even if it just for gardening, vegetable gardens and domestic work. But it is especially useful during shortage periods or the dry season, a very difficult period for most farmers in arid or semi-arid regions. 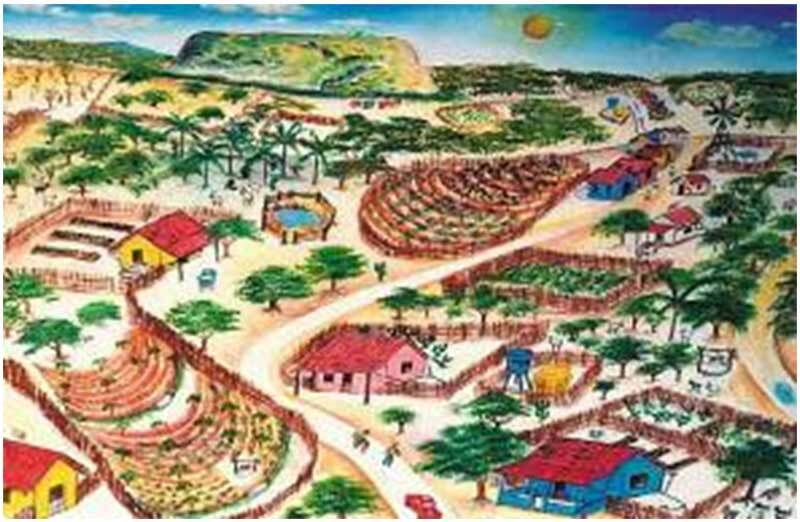 Of course the inhabitants of towns and peri-urban areas, but especially those in shantytowns and rural arid or semi-arid areas or with long dry spells, which have great difficulty in bridging the gap, for crops as well as for cattle, with the short rain or monsoon period. Systems are also now often installed in schools, boarding schools or in public places that lack water and toilettes and where the steel or tiled roofing have a large collection surface. 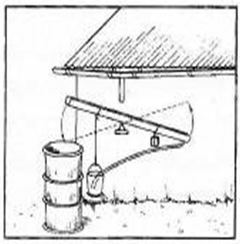 But there are also simpler collection systems, but of lesser quality, such as recovery in simple tarps or fabric or recovering rainwater from the roof of a latrine to supply a hand-washing station…. Recovering rainwater is also sometimes used for irrigation. As such in the delta of the Ganges in India, the in habitants have already dug more than 30,000 50x40m basins and 3 to 4 m deep representing one third of the surface to be irrigated. The actual size of the system will be according to several factors : the cost, the quantity of water to collect…The roof has to be of a satisfactory surface area, with non-painted steel, tiles or fibreglass. 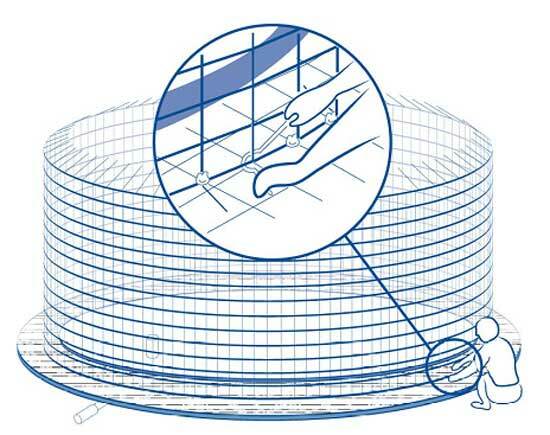 Then, the height of the roof has to be sufficient to allow the water to supply the reservoir via gravity. 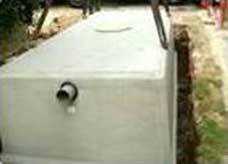 Type of storage container : most often, this is a reservoir and sometimes a tank (cf. chapter 7, the main types), even tarps and fabric. Sizing for this container : the volume has to take into account the duration of the dry season, the number of users and the usage time. It must indeed allow the users to obtain a substantial supply during the rainy season. V = t . n . q + es where t is the number of days in the dry season, n the number of people using the tank, q the level of consumption per person and per day and es the loss due to evaporation during the dry season. The appearance of the reservoir, which is in general not very aesthetic, can possibly be improved. In urban areas, manufacturers offer, rather than creating a simple reservoir or burying a tank, to create a "wall of water", a vertical reservoir with low width placed along a wall near gutters or able to take the shape of more elaborate containers such as amphorae. The environment must be taken into account. Indeed, if there are trees overshadowing the roof, the leaves and seeds can clog the gutters and the conduits. In addition, bird droppings and insects which fall on the roof will be washed and transported into the reservoir. A simple diversion system must therefore be provided for the first rainwater collected. If the reservoirs are buried, nearby tress cause problems due to the fact that the development of roots risks damaging the foundation or the coating of the tank, which then results in cracks and leaks. These must therefore be removed. The presence of a hard compact or rocky ground is an advantage in building tanks. Indeed, cracks can appear more easily when the foundations are placed on ground which can subside, expand or shrink. - A study conducted by IRC (International Research Centre in the Netherlands), concluded that collecting rainwater is more economic in regions where the amount of rainfall is between 100 and 500 mm per year. If it is higher, the costs will exceed the advantages and, if it is less, the advantages would not cover the costs. - Before choosing a system, a thorough examination should be done of the installation environment, the existing technologies and sectors for manufacture locally, materials easily available in the region and the respective costs and advantages/disadvantages in the various types of installations. - the tarp-reservoir, the simplest system but not very common except in countries such as Uganda (cost of €35 for 6 m3) as it is too simple and has to be supplemented with protection and only has a limited use. - the jar or amphora which is the simplest model and inexpensive in many countries in Asia, especially in Thailand where it is very widespread and which can be easily made yourself (cost : 13€ for a simple 2 m3 jar and €170 for more solid jar of 4 m3 made from fibrocement), a system which moreover has inspired certain designers in Europe. - the wooden reservoir, most often in the shape of a barrel, with the wood forming a good insulator and often inexpensive (cost varies according to the local price of wood, but for example €190 for 400 litres, or €279 for 2000 l in France). 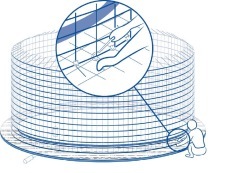 - the plastic reservoir (these can be found for €135 per m3 with support grid, or in reinforced plastic but are more expensive (large do-it-yourself centres for example sell rainwater recover tanks made from polyethylene 2.5 m3 with anti-rodent stainless steel grids and lid for €680). 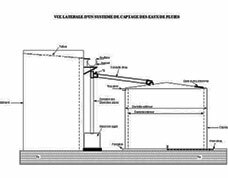 - the concrete reservoir, sometimes made from simple mortar, which has the advantage of neutralising the natural acidity of the rain, of being easy to set up and at a reasonable price (€200 to €700 according to the regions for about ten m3). Plan for a diameter of 90 cm for 5 m3 and 1.4m for 10 m3. - the ferrocement reservoir is of comparable advantage and the price is a little less and this is the most widespread model. After having created the ground with a concrete slab, the reservoir’s cylindrical structure is manufactured and its lid with concrete iron whereon is projected a mortar rich in cement (3 parts for 1 part sand) with a trowel over a thickness of 3 to 10 cm according to the height and the diameter of the reservoir. - the reservoir made from bricks, chipboard or stones and or bricks and cement which is often less expensive, (count on between €100 and €200 for 10 m3), more aesthetic or better using materials that are available locally. Count on about one 50 kg bag of cement and about a hundred bricks per m3. - the stainless metal reservoir, which is not very common and often more expensive but can be installed faster and it is prudent to provide sealed protection made of plastic. 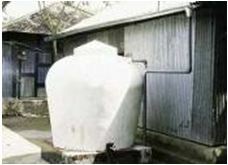 But the storage container can also be (less frequently) a tank, most often made from bricks, stone or concrete. More aesthetic and better protected from heat, but more expensive. 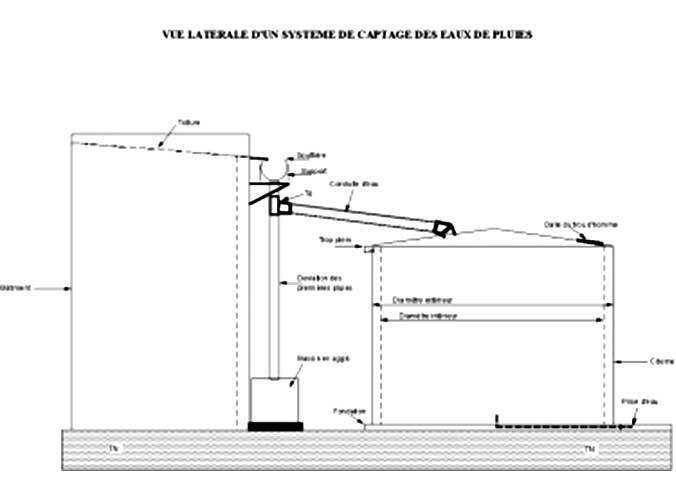 CREPA has evaluated in 2000 the total cost in Burkina Faso for a lateritic stone impluvium of 20 m3 (i.e. 20,000 litres) at 436,300 FCFA, which is about €655 (for which Foundation : 210, Reservoir : 200, Equipment-Plumbing : 95 and Labour : 150) and at 504 565 FCFA, which is about €770, if it was made from ferrocement. But this price can be lower when it is a question of simple les elaborate small equipment for family use. CARITAS Kaolack in Senegal in 2008 made 10-15 m3 ferrocement reservoirs for an average price, training of masons and in hygiene included, of €900 and thinks that it can lower the price to €450 once the training of the masons is complete. HELVETAS created in 24 villages in Sahel for a price varying from €600 to €900 (+ participation of the population in the work valorised at €60) 10 m3 impluviums making it possible to supply a family community of 10 to 15 people for 7 months, at 3 litres per person per day. The cost of the maintenance is in most cases almost nothing, but attention must be paid to maintaining the quality of the water over time and in the cleanliness of the installations, in particular before filling reservoirs or tanks. This technique is particularly adapted to domestic uses and to irrigation in regions suffering from a shortage of water, but also to certain public edifices such as schools or sanitary centres. It is sometimes used in a very rudimentary manner, as in Kerala in India where women simply suspend saris between the trees. The roof has to be smooth, hard and dense in order to be cleaned easily, resistant and able to return the objects that fall on it. No tree must be located near the roof. Birds constructing their nests on the roof must be avoided. The ends of the gutters must be provided with grids in order to stop leaves. The storage reservoir must have a hermetic cover which does not allow light in, and an inspection port and a drainage pipe at the bottom. For tanks, contaminated water (drains…) must not be able to infiltrate here. When the roof of the homes are of very poor quality, or when there is cultural resistance, such as in certain Miao villages in China, the NGO Initiative and development replaced the system with a water collection solution on large tarps of about thirty m2 set up on poles and connected to a reservoir. 1) The CREPA team created such a system in a school in Ouagadougou in Burkina Faso. The volume of the tank took into account the number of students, their water consumption during the eight hours spent at the school, the duration of the dry season (5 months) and the number of students at the school. 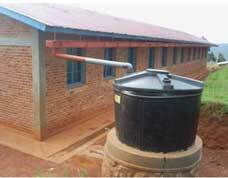 As such, for 200 students at 4 litres of water a day and per student, CREPA built six 20-m3 tanks which is a total of 120 m3. The 200 students are now sure to have water to wash their hands, use the toilettes and even drink it subject to certain precautions. 2) CARITAS created similar systems in schools that were impossible to connect to the water supply in Burundi and in Ethiopia. 3) See also the many achievements mentioned in the brochure from ARENE IDF which can be downloaded as indicated further on. 13) Where to obtain further information ? b) PSEau (Programme Solidarité Eau-32 rue Le Peletier 75 009 Paris) : www.pseau.org. In the "Search" window at the top right part of the welcome site, type "rainwater recovery" and you will have access to many articles. www.cta.int (click in the left column "Publications" then on "Rainwater harvesting for domestic use").